John S. Preston (John Smith), 1809-1881 Address of Hon. 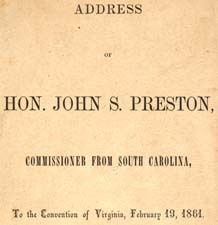 John S. Preston, Commissioner from South Carolina, to the Convention of Virginia, February 19, 1861. Address of Hon. John S. Preston, Commissioner from South Carolina, to the Convention of Virginia, February 19, 1861. Columbia, S.C.: Steam Power-press of R.W. Gibbes, 1861.